March 19, 2019, 19:00 was a historic moment for modern Kazakhstan. On that date and at that time, President Nursultan Nazarbayev, in a live state television broadcast, announced his resignation and handed the reins of power to his successor. It is worth noting, that over the past few years the issue of the transition of power in Kazakhstan has been actively debated among experts. This event was seen as inevitable in the political life of the nation. Preparations for the transition began several years ago. First of all, legislation introducing a system of checks and balances was drafted. Thus, at the beginning of 2017, a constitutional reform was carried out in the republic, which implied a redistribution of powers between the branches of government, namely, the transfer of some powers of the president to the government and parliament. Later, in the spring of 2018, the Parliament passed the Law “On the Security Council of the Republic of Kazakhstan”. According to the law, the Security Council became the coordinating constitutional body, and the right to lead the organisation was granted for life to the First President of the Republic of Kazakhstan - Elbasy. Of course, attention was paid to the February appeal of Nazarbayev to the Constitutional Council; he requested an official interpretation of the clause of the Constitution which concerns the conditions for the termination of the powers of the head of state. Despite the fact, this event’s realisation had been anticipated for a long time; it was difficult to predict that everything would happen this way and so soon. However, the departure of Nazarbayev is undoubtedly a carefully thought-out and optimal political step. Nursultan Nazarbayev resigned as president in a political environment that was calm and prepared, while retaining the main levers of power: the status of First President - Elbasy (Leader of the Nation), the Chairman of the Security Council, leader of the Nur Otan Party and Chairman of the Assembly of the People of Kazakhstan; he also retained membership in the Constitutional Council. In this context, the appointment of Kassym-Jomart Tokayev to the post of President pending the next election is quite acceptable, both for internal and external audiences. President Tokayev is an even, balanced politician with ample experience - as Foreign Minister, head of the government, and chairman of the Senate of the Republic of Kazakhstan. His set of competencies will more than suffice until the current presidential term expires. With Tokayev’s nomination, the continuity of the Elbasy’s course will be maintained, and existing initiatives and programmes will continue. In addition, in the formation of the new government, a number of recent appointments suggests that at the pre-election stage, the personnel policy will not undergo fundamental changes. If we consider in more detail what accents the presidency will take on in the near future, in domestic policy, of course, this is a social sphere. The solution of social problems was repeatedly raised in the last two presidential messages of 2018, in Nursultan Nazarbayev’s speech before the resignation of the previous government, and also at the February jubilee congress of the Nur Otan party. Moreover, the infrastructure programmes and digitalisation initiatives will be continued. As for the external environment, the principles of multi-vector approach, pragmatism and mutual benefit will be also preserved. The current and subsequent presidents of the country will continue to strengthen relations and strategic cooperation with Russia and China; the partnership with the countries of Central Asia and the EAEU will remain important. During the transition period, while the first president of Kazakhstan will keep the position of the head of the nation’s Security Council, serious changes or adjustments in the republic’s foreign policy are highly unlikely. 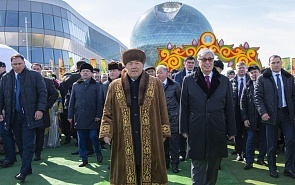 ﻿On March 19, 2019, Kazakhstan’s President Nursultan Nazarbayev made an unexpected address to the nation, announcing his resignation. The 30-year era of one of the most respected and authoritative politicians in the post-Soviet space is over. Therefore, now is the right moment to evaluate the legacy of the first president of Kazakhstan, both in the context of bilateral Russian-Kazakh relations, and in terms of Eurasian international politics as a whole.